If they are not playing in the yard, they are inside trying to decide who gets to sleep on which end of the couch. We of course have to make other sitting arrangements for ourselves to accommodate them. Cathy is currently President of the ASSCA and past President of the CSSA. All our dogs and puppies are CKC and/or AKC registered, vaccinated and health checked. 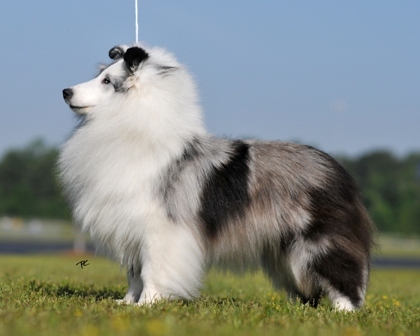 We are hobby breeders so we breed our dogs very selectively in our endeavour to present the best example of the Shetland Sheepdog standard. Whether purebred or not, all animals have a predisposition to certain medical conditions. We test to ensure we are giving our dogs the best opportunity to have a fulfilling, healthy life. Puppies are guaranteed for health conditions we can predict/test. We have a lifelong commitment to all our dogs. Even when they are adopted out. The unforeseen happens and we are always here to support our dogs when it does. We carefully screen prospective companion homes to be sure you are the right fit for one of our puppies and are prepared for the lifetime commitment that comes with a dog. Is your yard fenced? Have you had a Sheltie before? They deserve loads of love and attention from you. Are you ready? We also know we as breeders have to be the right fit for you.